Anarchy rules in Britannia as the Roman Empire collapses, and two men fight to build stable lives among the chaos. After more than four hundred years of Roman rule, the island its conquerors called Britannia was abandoned—left to its own devices as the Roman empire contracted in a futile effort to defend itself from the barbarian hordes encroaching upon its heart. As Britannia falls into anarchy and the city of Viroconium is left undefended, two cousins who remained behind when the imperial forces withdrew pursue very different courses in the ensuing struggle to unite the disparate tribes and factions throughout the land. Passionate, adventurous Dinas recruits followers and dreams of kingship. Thoughtful Cadogan saves a group of citizens when Saxons invade and burn Viroconium, then becomes the reluctant founder and leader of a new community that rises in the wilderness. The two cousins could not be more different, but their parallel stories encapsulate the era of a new civilization struggling to be born. This book starts with a prologue and that little chapter was able to rise my hackles. It was supposed to describe the history of the British Isles from the Ice Age to the Fall of Rome but contained factual errors and sounded like commercial drivel. I found it boring and inessential. Unfortunately, the rest was equally boring and dry. Llywelyn addressed an interesting question: what happened in Britain when the Romans left? How did the people struggle to survive in a power vacuum? How did they organize themselves – to hunt, to defend their households and their children, to trade? It must have been a real apocalypse and at first the author seemed to have a lot to offer, introducing two very different characters, cousins, with long standing differences. Whose vision would prevail, that of Cadogan, a level-headed, peaceful, law-abiding citizen and a Christian, or that of Dinas, a sly, resourceful and ambitious man who dreams of riches and power and doesn’t care for gods, old or new? Believe it or not, after the first 100 pages I didn’t care about the answers any longer. I would like to say ‘the story ran out of steam’ but the sad truth is it had never any steam to begin with. The cousins and main leads I mentioned above shared one common trait: they had emotional life and urges of Bob the Builder. Cadogan wanted nothing more than be a leader of a Roman city; Dinas loved his horse more than any other human, male or female. Even good, promising characters with comic potential, like Quartilla, a woman left behind by Dinas and found by Cadogan in his own fort, soon were just repeating themselves over and over again. With plot meandering aimlessly to and fro I gave up and DNFed this one near the middle point. Not even details which hinted in a surrealistic way at the genesis of the Arthurian mythos were able to save it. Writing historical fiction is not an easy task. Some lucky few know how to do it; the rest should steer clear of that genre for their own good. 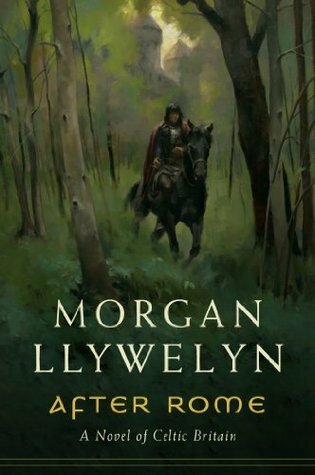 This entry was posted in a total failure, book review, historically-flavoured, rating, suspence and tagged a total failure, after rome, ancient Britain, boring, boring protagonists, dnf, morgan llywelyn, plot leading nowhere. Bookmark the permalink. The dreaded prologue strikes again! LOL and it gives a kiss of death to the book! Oh boy. That’s a bummer.